In the motorcycle industry, caster angle is synonymous with what would be called the head angle in the bicycle industry. Sometimes in the bicycle industry, the term caster angle is used to describe the arctangent of the trail divided by the wheel radius. 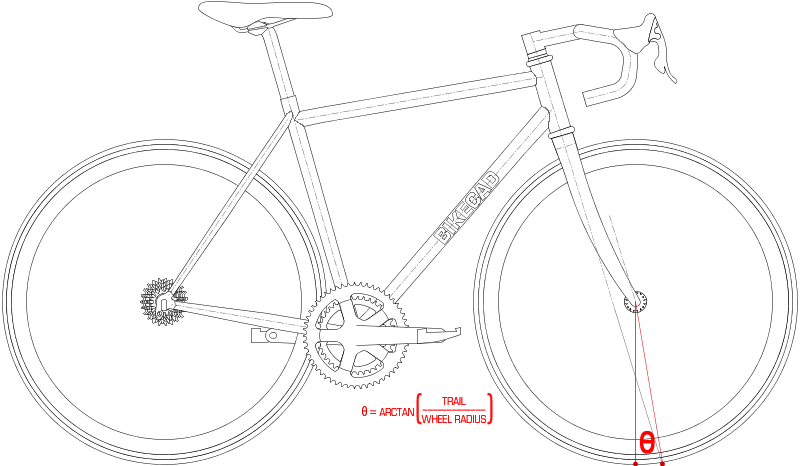 To avoid confusion, BikeCAD does not use the term caster angle. However, for those that are interested in this value, BikeCAD does display a dimension called the arctan(trail/wheel radius), (known by some as caster angle). This dimension is shown above.